Gymglish online help - FAQ (Frequently-Asked Questions) - How can I type accented letters? All Categories ​>​ Miscellaneous ​>​ How can I type accented letters? This article is only relevant for Frantastique, our French training and certification. Many French words require accents. It's dumb, we agree. 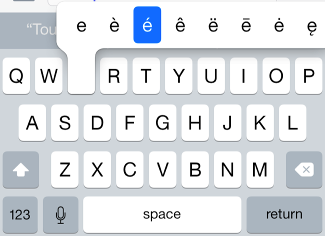 If your keyboard doesn't have accents enabled, please use the references below to help (mobile, desktop or tablet). You can use the integrated virtual keyboard. It appears at the right-hand side of the exercise box.